Trunks: Erect, 24 to 40 inches in diameter, frequently branching 10 to 25 feet above the ground; branches gradually curving outward, forming wide-spreading crown; bark of mature trees ashy-gray, thick, deeply furrowed with short, narrow, sometimes diagonal ridges. Twigs: Slender, zigzag, reddish-brown or grayish-brown, glabrous; young twigs pubescent to glabrous; buds red-brown, egg-shaped, pointed, slightly pubescent; leaf scars half-round; bundle scars 3 or 3 groups. Leaves: Alternate, simple, deciduous, obovate-oblong to oval, 1.6 to 4.8 inches long, .8 to 2.4 inches wide; upper surface dark green, rough, glabrous; lower surface lighter, slightly hairy; margins coarsely double-toothed; stalk stout, 1/12 to 1/4 inch long, glabrous or pubescent; base unequal, usually rounded on 1 side, tapered on other; tip tapering to point. Flowers: Loose clusters of flowers before the leaves; clusters less than 1 inch long; each flower on long stalk; stalks on unequal, .4 to .8 inch long; calyx bell-shaped, .1 to .3 inch wide, flattened, greenish, margins brown, fringed; corolla absent; stamens 5-9, exserted; stigmas 2, white. Habitat: Stream banks, bottom lands, open woodlands, rocky hillsides; rich, alluvial and moist loam soils. Uses: Native Americans steeped the inner bark and took the liquid to treat colds, coughs, and menstrual cramps and drank it like coffee. The root bark was boiled and the liquid used as a wash for sore eyes and for gun wounds. The wood was used for posts when constructing earth lodges and also as fuel. Comments: State tree of North Dakota and Massachusetts. 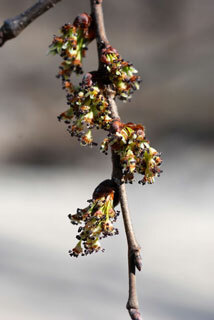 American elm was often planted as a shade tree, but is susceptible to Dutch elm disease. Wood light brown, hard, heavy, difficult to split, used for furniture, boxes, barrels, and flooring.